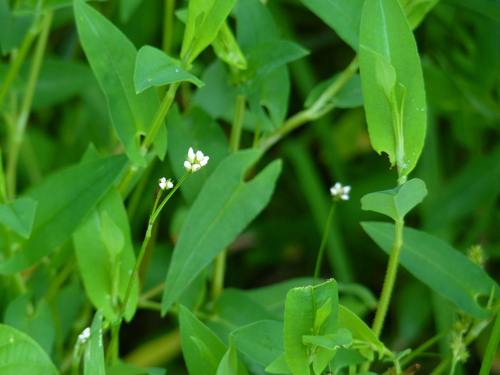 Polygonum sagittatum.Rob Curtis.www.inaturalist.org (Accessed 7/2014). Polygonum sagittatum is an annual vine 0.3-2 m long, often reclining over other plants. Stems with backward-hooked spines (recurved) along angles, often becoming red-purplish in age. Rooting along lower nodes, leaf sheaths rough-textured to 1.3 cm long. Leaves alternate, stalks on lower leaves 0.5-4 cm long,, upper leaves often nearly stalkless, prickly, blade arrow-shaped 2-8 x 1-3 cm. Flowers white to reddish, to 0.5 cm long, 5-parted, petals and sepals alike (tepals), tips blunt, stamens 8, style split to middle. Flowers in groups of 2-3, each with a small sheath to 0.5 cm long; inflorescence terminal or in upper leaf axils, densely flowered at tips. Fruit: An achene, dry, hard, black, 0.3-0.4 cm long, sharply 3-sided, tip pointed. seeds eaten by some waterfowl and muskrats (Martin et al. 1951). Blooming and fruiting Aug.-Nov. (Hough 1983). Habitat: Sun or partial shade, open marshes, pond edges, wet ditches. Soil pH 4-8.5, tolerant of brackish water (Hough 1983; USDA, NRCS 2006). Note: Can form dense tangles of clinging, prickly, vegetation in marshes.